The Dark Horse comic based on the videogame Mass Effect has just released its final issue. Mass Effect Evolution is a four issue comic detailing the origins of Mass Effect’s “Illusive Man”. The “Illusive Man” is the powerful leader of the organization called Cerberus. With almost endless resources, the “Illusive Man” puts humanities best interests ahead of any other species in the universe. He’s a dangerous and intriguing character, and where he came from and how he built the Cerberus empire is shrouded in mystery. The war isn’t the centerpiece, as Jack and friends discover an ancient artifact that seemingly alters those who physically contact it. Jack Harper tries to save one of his colleagues from touching the artifact, and in doing so he is also altered…but not to the extent of those who come into full contact with this “Arca Monolith”—as the artifact is called. Ever wondered why the “Illusive Man” has glowing blue eyes? Well Mass Effect Evolution shows how that happened. Unfortunately, it doesn’t really show how Jack Harper accursed the wealth in order to build Cerberus and take the moniker of the “Illusive Man”. Which is misleading, since that’s exactly what Mass Effect Evolution is supposed to be about: the origin of the “Illusive Man”. The final pages don’t detail how “Illusive Man” built his organization; all of a sudden he just has it. We do learn a few things. For one, “Illusive Man” may not be in full control of his own actions—I won’t spoil anything for those who still want to read each of the four issues of Evolution. But there definitely is questions raised about the “Illusive Man”, and very few of them are answered in the issues of Mass Effect Evolution. 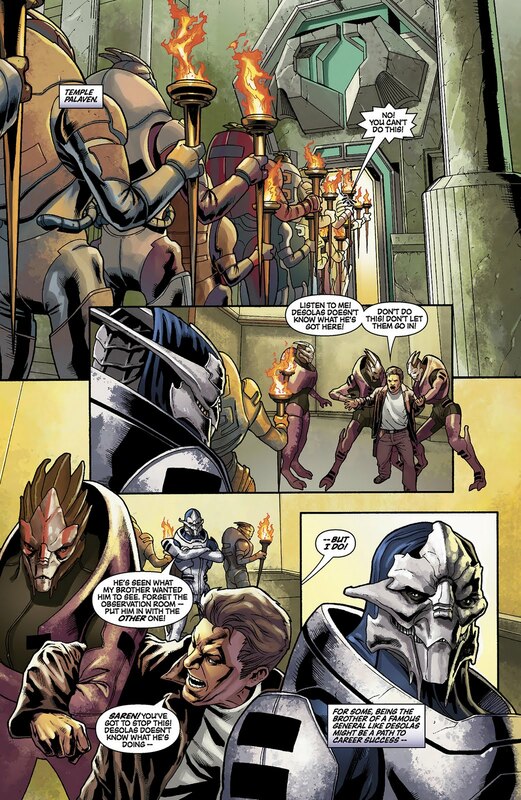 You also see the story of Saren, the main villain from the original Mass Effect. While we don’t get a full story on how Jack Harper turned into the “Illusive Man” we do see how Saren became the person he is in Mass Effect…kind of. That’s because Mass Effect Evolution devalues some of Saren’s reasons to hate humanity and wish for their destruction. One of his biggest reasons for hating humans is because a human killed his brother. Mass Effect Evolution has the full take on those events and the fate of Saren’s brother is revealed. And it just doesn’t fit with what was established in Mass Effect. Saren has no reason to hate humans at all. It’s okay to give characters more backtstory…what’s bad is when that story contradicts itself. It seems unnecessary to tell Sarern’s story this way. I would only recommend Mass Effect Evolution to Mass Effect fans. That’s a major flaw. Mass Effect Evolution isn’t a strong story. 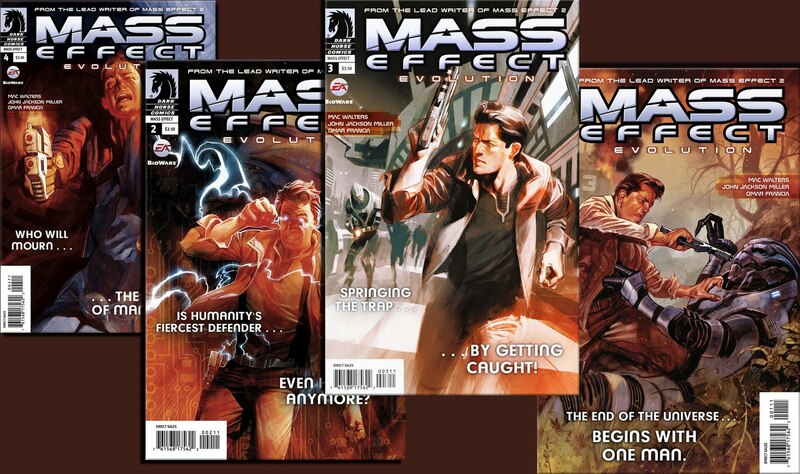 And without the Mass Effect license it would be a pretty terrible four issue comic. The art is very underwhelming—Jack Harper looks different in almost every panel; its just not very pleasant to look at. Nonetheless, Mass Effect Evolution does give detail on the characters of Saren and the “Illusive Man”. But none of the information is necessary to understand any of their respective motivations and personality traits. Mass Effect Evolution gives an unsatisfying abridged version of the origin of the “Illusive Man” and contradicts the character of Saren. I recommend the Mass Effect novels over this trade—skip it.